DEVO Roost Blend coffee will be available for sale during the Iron Horse Bicycle Classic Velo Swap. Local brew-masters, Desert Sun Coffee have dialed in a sweet blend for us to sell to the masses. At 13 bones a bag, it isn’t cheep, but heck, the kids are worth it. Only 50 bags were packaged, so get there early! Durango’s Cale Redpath of the Directory Plus squad, took an impressive win this past weekend at the Front Range 50, finishing in 3hrs 9min. Of the 160 starters, Cale was one of 16 singlespeeders. He did not only win his singlepeed category, he won the whole darn thing. 50 miles, 1 gear, priceless. 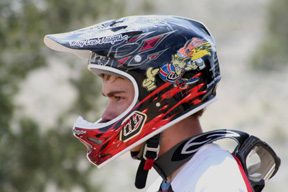 Chase Orrick’s new Durango DEVO tv segment will begin airing wednesday on local channel 15. 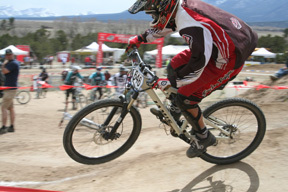 Chase will be producing bi-monthly segments throughout the summer showcasing DEVO’s mtb happenings. Keep up the sweet work Chase! Bike polo is gaining momentum all across this sweet land. It has appeared recently in car adds in People and Newsweek magazines, a sports brief in the latest Outside magazine and in the movie theatres in the new flick, What Happens in Vegas. Dang. Bike polo has been taking place in Durango regularly since 1999 and has no signs of slowing down. Rumor has the local team looking at getting new matching socks. Dang. We’d like to give a big ol’ shout out to Rob and the rest of his silly crew at Bread Bakery. Not only do they have the best coffee, BLT’s and cookies in town, they also have the biggest hearts. Nothing but good vibes from the folks down at Bread Bakery. Thanks for being in love with us Rob, right back at you! Check it out Jr DEVO, a sweet spring session season ending team ride to showcase you amazing skills. June 11th 530-830 at the Three Springs Circuit Course. The .4 mile loop is loaded with nice turns and fresh lines for all of you to shred. See you there! Kids on Bikes! Thanks to Deb Hall and Brian Peterson for having fun with the Durango rad pack, getting them off to a great start in a great sport. Rock onward! B+ rides for the summer, effective immediately! ride are asked to split the group if it exceeds 40 riders. Wednesday night the DEVO mens and womans mtb teams will be open to the public from 430-530pm at the Fort Lewis Factory Trails, located at the south end of campus, behind the Bader Dorms. Come and join the young rippers as they play short track games. A great workout will be had by all. See you there. Saturday May 24th 5-9pm at Buckley Park, DEVO will be selling beverages donated by Coca-Cola for the post race concert and we need help. Sunday May 25th 7am-9am kids race and Tom Danielson Junior Series, we need coarse marshals to help during races. 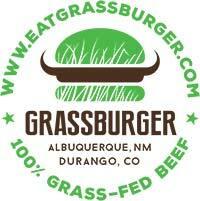 Please contact annie@durangodevo.com if you can help us during this busy weekend. Thanks and great job Annie! Yo Yo Yo, the trails were fast for team Durango DEVO’s 2nd monthly Telegraph hill climb time trial. Improvements were seen by almost the entire team. Its amazing how that works; you practice consistently and then wham….your faster. Wednesday night from 530-8pm will be the kick off to the summer short track training races to be held every wednesday night for 9 weeks. Three Springs will be hosting our first event and will be providing Zia Taqaria and Robin Davis on the guitar. B men and women start off at 6pm, Jr DEVO at 630 and A men and women at 7pm. Circuit races will be 20min for B and Jrs, and 30 for A riders. This is a DEVO fundraiser as a suggested donation for the burritos and circuit race will be suggested. The course is located at the east corner of the Mercy Hospital parking area. The remaining 8 wednesday night short-track will start at 6pm at various locations around Durango. A detailed schedule will be revealed soon. The races will suggest a donation of $5 and will go to kids on bikes. These are low key, no category, no fuss, training rides. 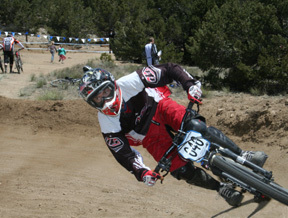 For all of you who are wishing Taylor a good race run in Angel Fire, and do not know what he looks like on a bike, here ya go. Taylor is racing for a spot on the USA Worlds team that will be competing in Italy in mid June. Rocket Fire Taylor!